Beading Arts: Metal clay month! This month, I'm going to be focused on bringing you wonderful work by artists who specialize in metal clay: gold, silver, bronze, and copper. 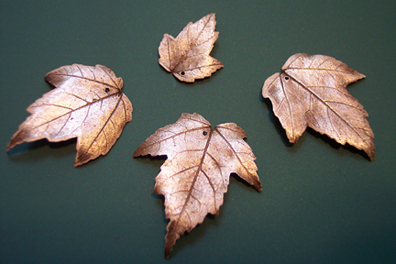 To start off, here's a very simple project that I did with silver clay paste and some teeny tiny new leaves from our maple tree. These are each only about 3/4 inch across. Throughout the month, I'll be sharing lots of resources, links, and fabulous metal clay artists with you. In the meantime, if you're interested in working with silver clay, there are two brands available that you can research. Rings & Things carries Art Clay, and Rio Grande carries PMC. If you are a metal clay artist and would like to share your work with us, just drop me a line at cyndi @ mazeltovjewelry.com (remove the spaces). I can't wait to read the rest of your blogs on metal clay. It's something I always wanted to try, but never knew where or how to begin. Thanks so much! Well this will be a fun month! Your PMC maple leaves are so delicate. They're just beautiful. Thank you, Eileen. They're super easy to make, just a bit time consuming to do lots of thin layers. Many people have gone *far* beyond this simple project, and we're going to see lots of them this month! I can't wait to see them... I've been dying to find and try the metal clay...I obviously have to know!